This Saw-Whet is keeping an eye on things. Perched nicely on the branch and posing for me. 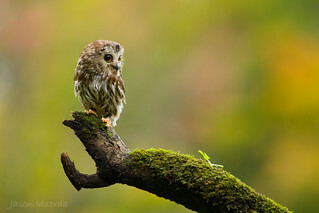 The Northern Saw-whet Owl is a miniature owl native to North America. Adults are 18 cm long with a 43 cm wingspan (about the size of a pop can). The Northern Saw-Whet Owl has a round, light, grey face with brown streaks; they also have a dark beak and yellow eyes. The underparts are pale with dark streaks; the upper parts are brown with white spots.